Each unit combines a specially designed blower in a metal housing, with a filter and grille. Our collection of Packaged Standard Twin Blowers, Recessed Twin Blowers, EMI/RFI-Shielded Twin Blowers and Broad Discharge Twin Blowers comprise one of the most extensive and versatile standard product lines available. When combined with selections from our complete array of accessories and options, these blowers can provide the solution to virtually every application requiring a packaged unit utilizing ambient air for cooling. All KOOLTRONIC blowers are designed to isolate vibration of rotating parts from housings and mounting flanges for smooth, quiet, trouble-free operation. 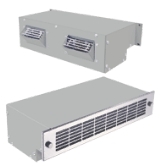 If a packaged blower is not the right product for your application, other electrical enclosure and cabinet cooling products to consider are air conditioners, heat exchangers and fans. Standard Twin - These are the most popular Kooltronic Packaged Blowers. These blowers achieve exceptional performance through use of the largest possible blower housings and wheels Each contains a quadruplex centrifugal blower powered by a single precision ball bearing motor. These widely-used blowers deliver air from more than 50% of their 17-inch [431.8mm] width, while conventional blowers deliver air from only about 30%. Internal neoprene isolation mounts reduce transmission of vibration and AC hum to the enclosure. 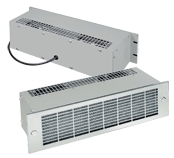 Recessed Twin -These blowers provide maximum air delivery using a minimum of panel height, and are used where panel space is a critical element in the design and packaging of an electronics system. The Recessed Twin Packaged Blowers utilize the same powerful quadruplex blowers featured in Standard Twin Packaged Blowers, providing the same excellent performance and service-life characteristics. EMI/RFI Shielded Twin -These blowers conform to the latest technology in attenuation of electromagnetic interference. The KPR Series combines this shield with Standard Twin Packaged Blowers. In addition, the shielded front end can be incorporated into the entire broad line of Kooltronic Packaged Blowers, as an option, with a few dimensional changes. Kooltronic achieves a high degree of EMI attenuation by the use of proven techniques and scrupulous production and quality controls. EMI/RFI-shielded fronts, in packaged blowers or used separately, do not reduce air delivery. Broad Discharge Twin - These blowers combine a quadruplex centrifugal blower with an internal plenum chamber to provide an even distribution of air, delivered across the entire width of the cabinet. This permits installation directly beneath the electronics for overall cooling of rows of printed circuit cards or similar electronic components, without need for a space-consuming external plenum chamber. 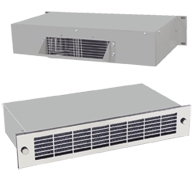 The blower assembly that provides the cooling air includes the same quality features as in the Twin, Recessed, and EMI/RFI-Sheilded Packaged Blowers. Pagoda Series - This series uses motorized impeller blowers for maximum efficiency and performance at reduced noise levels and have been designed for mounting on the top or sides of the cabinet. Air flows out of the cabinet into the inlet of the blower, exiting on all four sides. The Pagoda is available in standard and custom sizes. They are designed to accommodate 115 and 230 volts, 50 and 60 Hz, and are available in various sizes, flows and static pressures for a wide range of applications. All components are UL, cUL Recognized and the motor carries a CE mark.